On Wednesday, as Bradley Manning's defense lawyers struggled to convince the ex-soldier's judge to hand down a lenient sentence, the U.S. Army released a photograph of the ex-soldier in a blonde wig and make-up. The original image had been sent by Manning to both his military therapist and supervisor, attached to an email entitled "My Problem." Manning has been convicted of almost two dozen crimes after leaking classified military information to WikiLeaks back in 2010, and his defense lawyers are claiming that Manning's reasoning at the time compromised by mental issues, his "post-adolescent idealistic phase" (a phrase, by the way, taken straight from Clueless ), and his struggle with gender identity. Manning told his supervisor that he'd signed up to "get rid of it," but by that point he'd began to exhibit alarming psychological symptoms: "SPC Manning [shows] an altered or dissociated state of consciousness," one of his superiors wrote in a memo. Another noted that Manning "fluctuated during the conversation between a calm individual and one in pain." Manning apologized yesterday for his leaking of more than 700,000 classified Army files. "I am sorry for unintended consequence of my actions," he told the court. "When I made these decisions, I believed I was going to help people, not hurt people." The presiding judge, Denise Lind, has free rein to sentence Manning to anything she feels appropriate: there is no minimum sentence in Manning's charges, but he'll likely spend a decent chunk of his life in prison. The maximum sentence he might receive is 125 years. 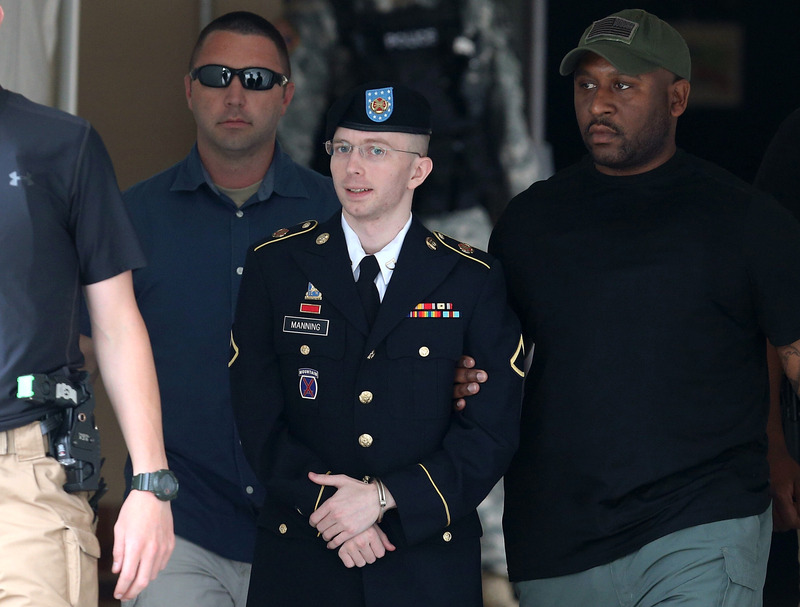 The Army's decision to release the photograph can be read in three ways: as an appropriate piece of evidence to help Judge Lind make the right decision; as a move hitting back at Manning for betraying the army; or, evidence backing up Manning's claim of being mentally unstable, which could lead to less time behind bars. Certainly Manning's own lawyers would have chosen to reveal the photograph if given a choice, since it goes to the heart of their argument for leniency. Being in the military and having a gender identity issue does not go hand in hand… At this time, the military was not exactly friendly to the gay community, or anyone who held views as such. I don't know that it is friendly now, either, but it seems to be getting toward that point. You put him in this environment — this kind of hyper-masculine environment, if you will, and with the little support and few coping skills, the pressure would have been difficult to say the least. It would have been incredible. I don't know what to do anymore, and the only "help" that seems available is severe punishment and/or getting rid of me. Several commentators have asked why a junior Army officer with demonstrated mental instability had access to three-quarters of a million classified documents at all, and why security measures weren't in place to stop him from leaking them.